Action Pack #9 - To the Bridge! 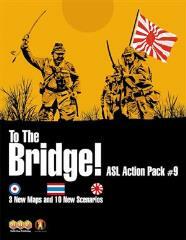 TO THE BRIDGE!, the ninth “action pack” for Advanced Squad Leader, focuses on the 1942 Japanese invasion of Burma and the crushing Allied defeat and retreat to India. Beginning with the December 1941 invasion of Thailand and ending with the disaster at the Sittang bridge in February 1942, TO THE BRIDGE! is the first of three planned Action Packs covering the campaign from the Japanese invasion to the Allied liberation. TO THE BRIDGE! features Japanese infantry forces against Commonwealth infantry supported by light armored cars and carriers: Burma Rifles, Gurkha Rifles, Indian Brigade, and various frontier forces. Plus a Japanese seaborne assault opposed by the Thai army supported by the Pattani Provinicial Police Force and units from the military academy. TO THE BRIDGE! also includes optional “Australian Balancing (Bidding) System” (ABS) provisions for each scenario. ABS is intended to allow for scenario side selection via a series of escalating handicap bids. Among other advantages, this can help balance scenarios between players of varying ability. Three double-sided 11” × 16” maps round out the package. Each board is completely geomorphic and compatible with previous ASL mapboards. Offering novel map configurations, these are sure to spark the interest of designers and players alike. Featuring a number of tournament length scenarios, TO THE BRIDGE! is the perfect companion to the recently released RISING SUN. Designed for the aficionado, Action Pack #9 is not a complete product and assumes the buyer owns the core Advanced Squad Leader game system.